With friends and boyfriends out of the picture since Thursday I have spent a lot of time recently much to myself allowing some independent, crafty activities…and I made some good progress. 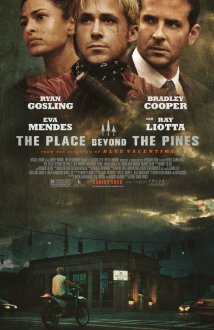 Thursday I had free screening passes to a new movie with Ryan Gosling and Bradley Cooper in it called Place Beyond the Pines and I took advantage of it and picked up dinner and headed to the movie by myself (I tried to get a comrade but no one was available). Veggie Grill Thai chicken salad and a surprisingly good (if not too long) movie to complete my Thursday night solo. 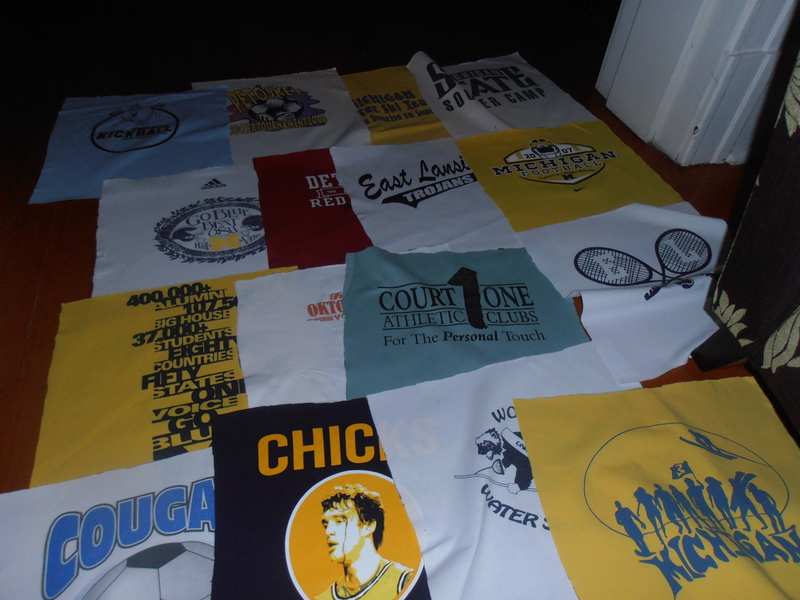 A lot of the weekend I worked on my t-shirt quilt. The preliminary steps have taken a lot more time to complete than I would have expected. 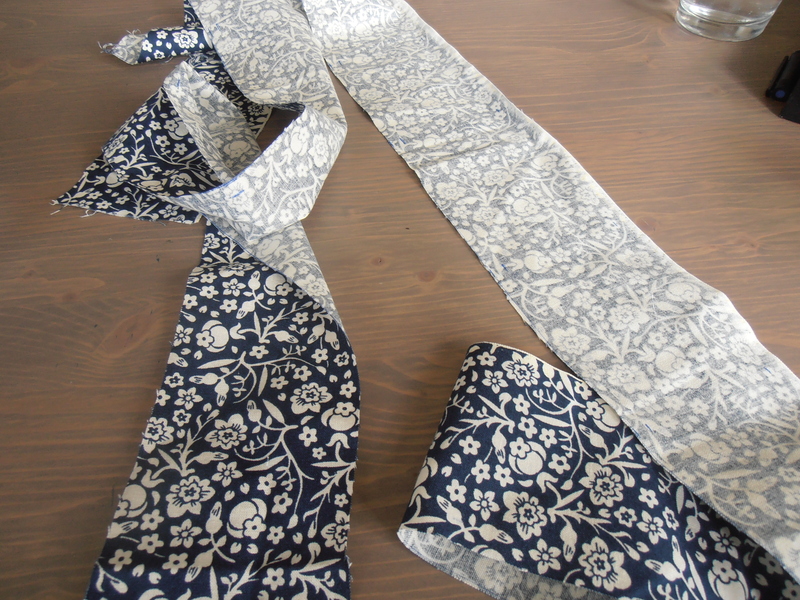 I had to cut out all of the sashing to the appropriate size and draw lines for where I needed to sew on both the sashing strips and on the t-shirts themselves. This took a long time getting them pretty precise but was a good indoor activity to fill my time during this super rainy weekend. I also saw too potential properties for sale, spring cleaned my bedroom, kitchen, and living room, did laundry, including my sheets and comforters, got my eyebrows waxed, updating my garden track sheet on sproutrobot.com and cleaned the bathroom. T-shirts ironed to fusible, cut to size and layed out. I also saw my boys win their game against Syracuse on Saturday night to send them to the Monday night game playing for the National Championship. Suspenseful and awesome!!!! I feel like a proud mama. And Sunday I bundled up in all of my ski gear to venture out into the rain. 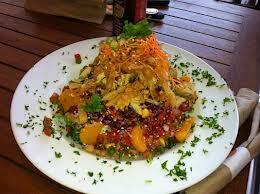 I had an AWESOME yoga class at Lululemon, got another lunch from Veggie Grill (so good! ), stopped by the library and the store. I attempted more crafts but was mainly happy that my roommates were back!! 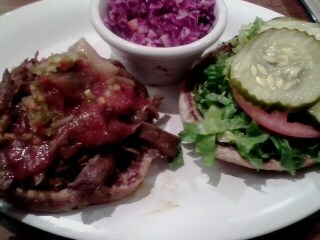 Veggie Grill Chipotle BBQ Chicken sandwich with side of red cabbage slaw. Super yummy and a slight kick.